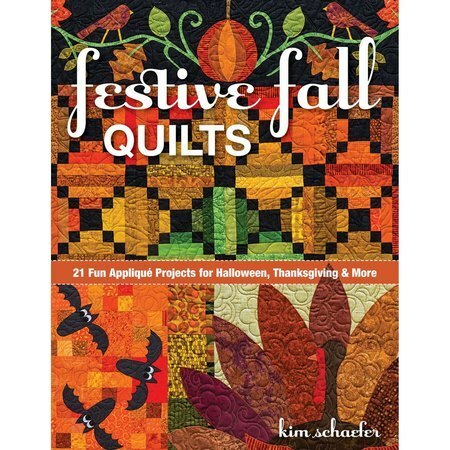 Festive Fall Quilts by best selling author Kim Schaefer includes 21 engaging piecing and applique project for fall. This collection sticks to tried-and-true motifs such as pumpkins, sunflowers, acorns, turkeys, and fall leaves but also celebrates Halloween with spooky spiders, friendly bats, expressive jack-o-lanterns, and more! This book allows you to make a variety of projects from tea towels and place mats to quilts and table runners. These quick and easy applique projects will have your home bright and festive just in time for fall! Bonus: Full-size pattern sheet included! Pattern pullout size: 8.5" x 11". Published by C&T Publishing. 64 Pages.